First off, thank you in advance for your tips and answers to my question. I want to give the Lindex Exchange a chance for buying lindens since I'm hoping to save a bit money. Usually, I buy and receive instantly but I don't mind waiting 3-5 days either. My question is what is the most reliable/best exchange rate should I put in? I don't want to put it so high that it never gets filled. 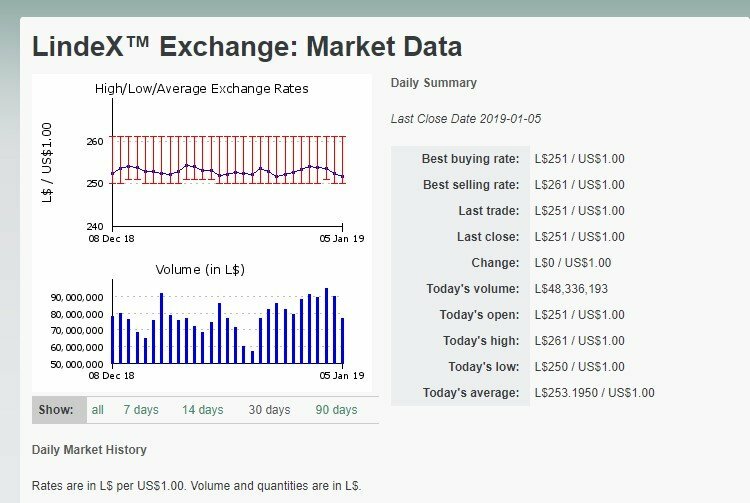 Open your dashboard and look at Linden Exchange >> Manage >>> Buy L$ . 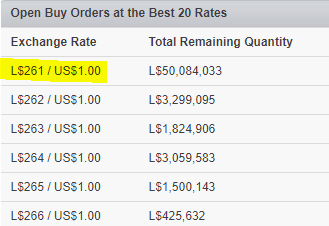 Notice that if you want to but L$2500 at the current market rate (which calculates out to 2500 / 9.97 = L$250 / $1 ) , you will be paying 39 cents more for making an instant buy than if you placed an order at L$261 / $1. The first lesson, then, is that it's probably not worth doing a Limit Buy unless you are planning on buying a LOT more than L$2500. In fact, Limit Buy doesn't really start to look attractive unless you are buying L$10,000 or more at a time. That's the rate at the top of that table ... the most popular rate at the moment. If you place an order at that rate, there will be L$50,084,033 worth of orders in line ahead of you, and Linden Lab is estimating that it will take 4 days for your order to reach the top of the stack. If you are greedier than that and want to buy L$262 for a dollar, you'll have to wait for all of the people at L$261 to get their orders filled, plus the L$3,299,095 worth of orders at the higher rate. It will take more than just 4 days. So, you pay a price for getting greedy. If you are willing to but at a lower rate, however, your order will be filled sooner. You'll just have to accept fewer L$ for your dollar. So, how low are you willing to go? Certainly not all the way down to L$251 / $1, where you might as well just use the Market Buy option. The lower you go, the faster your order will fill, though. Usually, the best answer is no more than L$1 or L$2 per dollar lower than the suggested rate. That way, you get ahead of the crowd but still get a lot more L$ for your buck than if you bought at the Market rate. So, try L$260 / $1. If you buy L$26,000, it will cost you $100 (plus the $1.49 transaction fee), versus $103.59 at the Market rate. You will save a whole $3.59 .... almost worth it. I never pay attention to the "suggested" rate in the Limit Buy box. And I especially never believe the "Estimated Time to Fill"...that is often wildly in error. What I do is go to LindEx/Manage/Market Data. THEN I go to LindEx/Manage/Buy $L, and look at the rates and outstanding order quantities Rolig pointed out. THEN I compare what I would pay if I just made a Market Buy with various choices of Limit Buy rates. You can do this by actually filling out an order as if you were going to make it, and see the "expected proceeds" numbers. Just don't click the confirmation button. Decide if the savings will be worth the wait. Then I make my decision. As Rolig says, an order at a rate one or two $L better than the current market rate will generally fill within a day, or at most a few days (if the outstanding orders aren't too enormous). Orders at three or more $L off the market rate can take quite a while to fill. I typically look at the Open Orders chart and then put in a request at 1-2 L$ less than the lowest value. So for this chart, I'd put my request in for L$260 or L$259 per US $. The longest I've ever waited when doing it that way is about 24 hours and most of the time it fills in less than an hour.